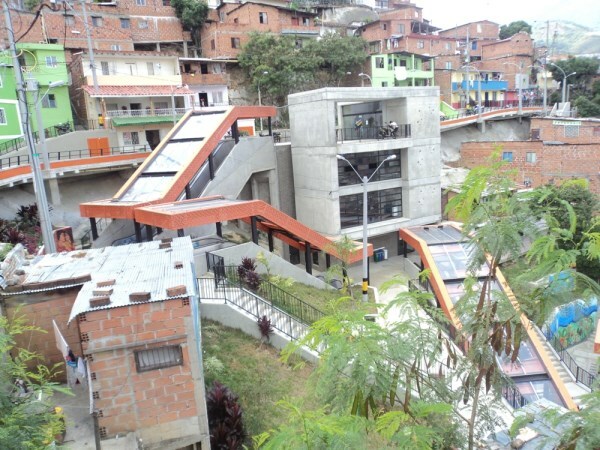 In 2011, a huge outdoor escalator was erected in one of the poorest districts of Colombia's second largest city. For generations, 12,000 people living in Medellin's tough Comuna 13 – which clings to a hillside – have made the arduous journey up hundreds of large steps, which are the equivalent to climbing up a 28-story building. 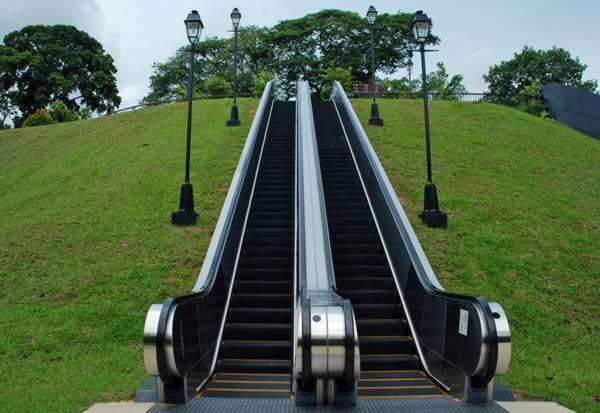 With the installation of a giant outdoor escalator, their journey was cut from 35-minutes to just six. Grateful residents say, "it is a dream come true." The escalator is 1,260 feet long, but is divided into six sections so people living on all parts of the hillside have easy access to it. Bike riding is very popular in Norway, especially in the city of Trondheim. However, there is a steep hill in the city called Brubakken that most bicyclists wouldn't climb because it was too steep. So, the city became the first in the world to have a lift specially designed to help cyclists travel uphill. The first prototype was installed in 1993. Since then, it's become a popular tourist attraction that's powered more than 200,000 cyclists up a 130-meter hill, with no accidents recorded. The original lift was dismantled in 2012, and replaced a year later with CycloCable, an industrialized version upgraded to meet new safety standards. Visitors to the Hualien Farglory ocean park in Taiwan can travel through the main aquarium on an undulating airtight escalator as sharks, rays and other aquatic creatures float just meters above their heads. 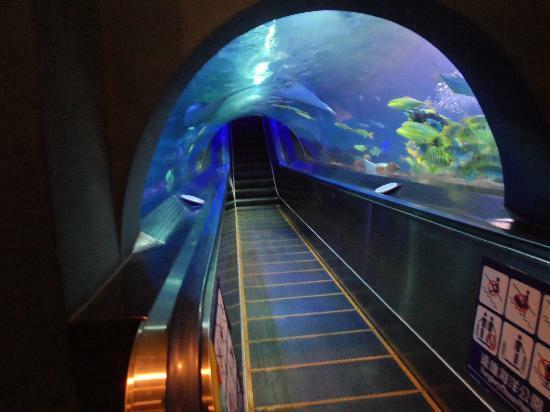 Even more impressive is the fact that the escalator is staggered, allowing passengers to ascend and descend into the depths of the aquarium on a single stairway. 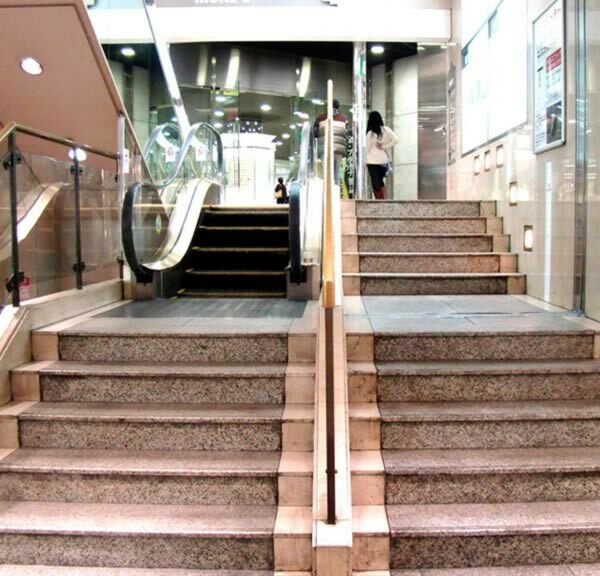 The world's shortest escalator is located in the basement of More's Department Store in Kawasaki, Japan. 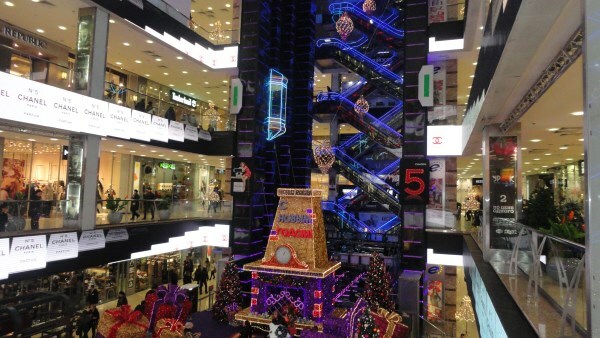 With only 5 steps, the escalator has a modest rise of 32.8 inches (83.4 cm). It was recognized as the world's shortest escalator by the Guinness Book of Records back in 1989 so it's possible a shorter, even more useless escalator exists. 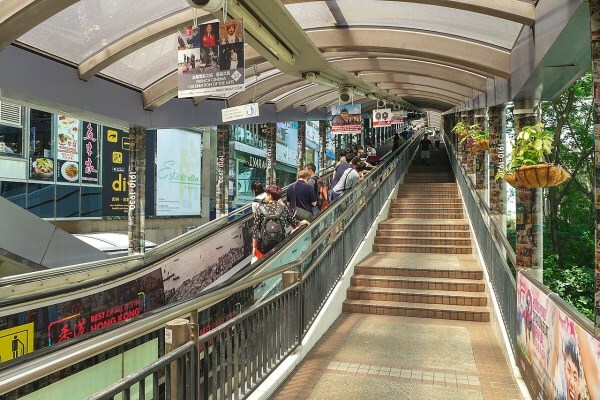 In one of Hong Kong's smartest residential areas known as Mid-Levels, the public is served by an unusual form of transport – the longest outdoor escalator system in the world. The Central-Mid-Levels escalator system covers over 800 meters in distance and elevates approximately 135 meters from bottom to top. It consists of 20 escalators and 3 moving walkways, connected in places by footbridges with 14 entrances and exits. To ride the complete length of the escalator system one-way takes about 20 minutes. It was constructed in 1993 to provide a better commute by linking areas within the Central and Western District on Hong Kong Island. Macy's Herald Square, originally known as the R. H. Macy and Company Store, is the flagship of Macy's department stores, located at Herald Square in Manhattan, New York City. The building's 2.2 million square feet made it the world's largest department store until 2009, when the South Korean chain Shinsegae opened a bigger store in Busan. Macy's Herald Square was the first building in the world to have a modern day escalator (1902). 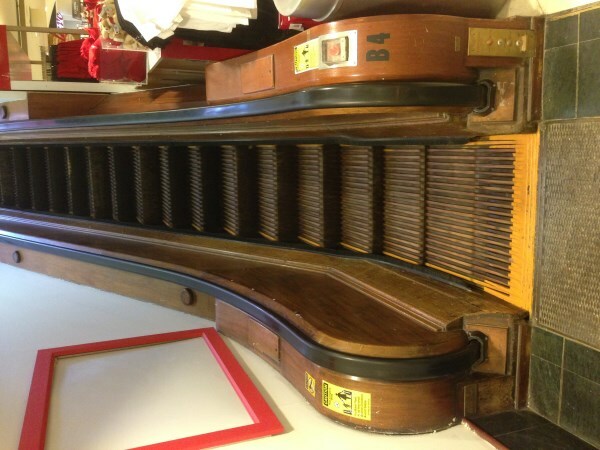 Today, most of them have been replaced, but you can see still see Macy's Wooden Escalator in use today. Glowing escalator at the Evropeisky Mall in Moscow, Russia. The crisscross layout minimizes space requirements by "stacking" escalators that go in one direction, frequently used in department stores or shopping centers. Tokyo-based blogger Miha Tamura is on a mission to rescue the escalator from urban transport obscurity. At her site, Tokyo Escalator, Tamura tries to capture the extraordinary side of this everyday ride. Despite its mundane name, the site also features cool escalators from other Japanese cities, as well as a few from other parts of the world. This photo is from a spiral escalator located in Osaka. 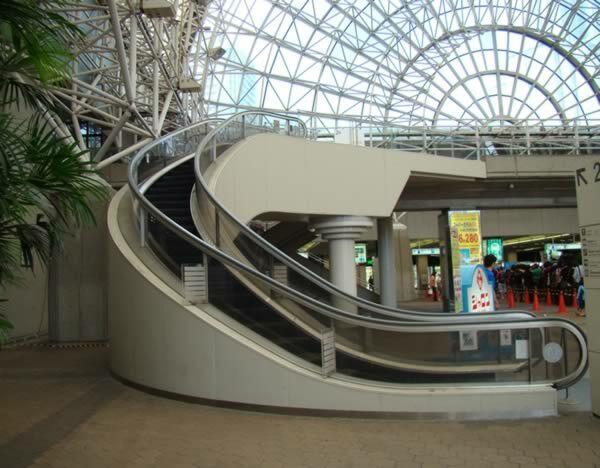 Spiral escalators have been sold by Mitsubishi since the 1980s, when the first example was installed in Japan. 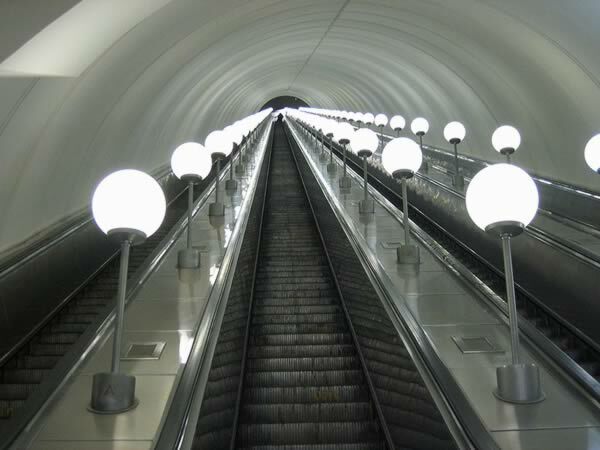 The deepest station of the Moscow metro is "Park Pobedy," 84 meters below ground (the height of 28 story building.) It's one of the deepest stations in the world. At the same metro station one can experience one of the longest escalators in Europe – each escalator is 126 meters long and has 740 steps. The escalator ride to the surface takes approximately three minutes. Standing at the bottom one cannot see the top. Outdoor escalators next to the National Museum of Singapore to Fort Canning Park.